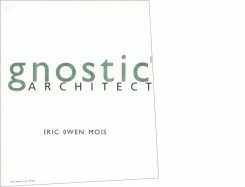 This volume illuminates how Eric Owen Architects avoids traditional organization strategies, standardized design solutions, and any notion of architecture as simply a repetitive style. 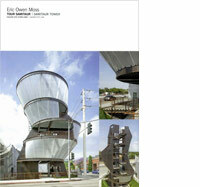 This monograph explores over three decades of buildings that make up the expansive Culver City / Hayden Tract project. 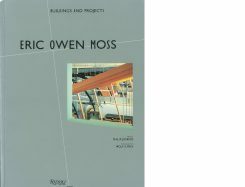 This book traces the intellectual odyssey of Moss’s forty year career with a comprehensive presentation of the twenty-five year process that led to his recently completed Cactus Tower and Waffle. 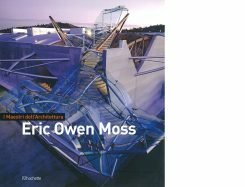 A collection of selected lecture introductions by Eric Owen Moss that span the entirety of his career as director of SCI-Arc. 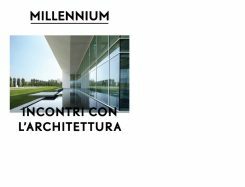 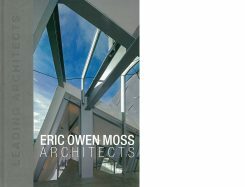 A number of Eric Owen Moss’ built projects are featured in this 70-page Italian monograph devoted to showcasing work by great contemporary architects. 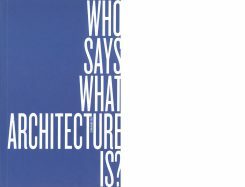 The sequel to “Who Says What Architecture Is?” collects a series of prosed lecture introductions by Eric Owen Moss at SCI-Arc. 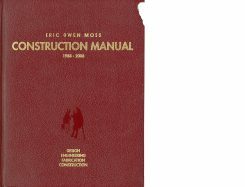 A 1,562 page monograph covering design, engineering, fabrication, and construction of 40 projects over the past 20 years. 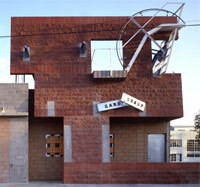 Features an array of works including the Wedgewood Holly Complex, the Beehive and the Box. 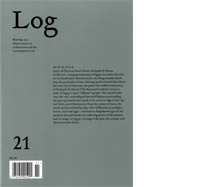 Illustrated by 250 pictures. 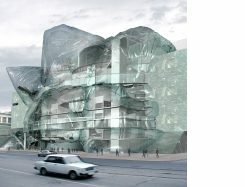 Who Says What Architecture is? 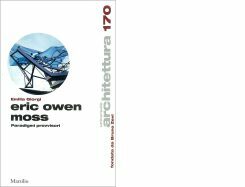 The essays collected represent a running commentary on topics and people encountered in the practice and at SCI-Arc as they intersect with Moss’ interests. 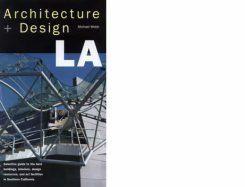 This book considers mostly built work including continuing projects in Los Angeles and Culver City, as well as important international projects in Vienna, Dusseldorf, and St. Petersburg. 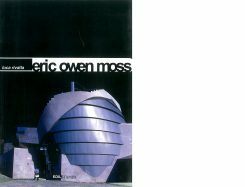 Using the Cineon Kodak building as a starting point, Moss undergoes a personal examination of his ideas on architecture and urban planning. 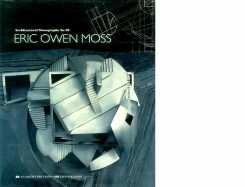 This volume covers 25 of Moss’ projects from 1990 to 1995 including the Lawson/Westen House and the Ince Theater. 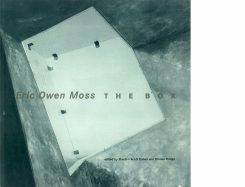 A series of interviews with Eric Moss and essays from Peter Rowe and Herbert Muschamp discuss the origins and implications of Moss’ design for The Box, a building in Culver City. 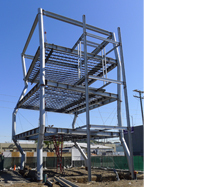 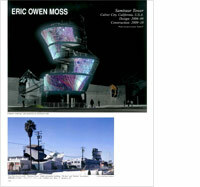 CD-ROM featuring Eric Moss’s collaboration with developer Samitaur Constructs to revitalize an industrial tract in Culver City/Los Angeles. 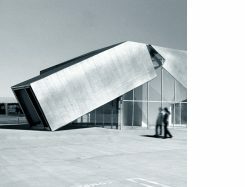 A selective guide to the best buildings, interiors, design resources, and art facilities in Southern California. 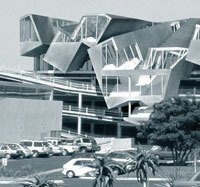 A book tracing the development of the Pittard Sullivan Headquarters in Culver City, CA. 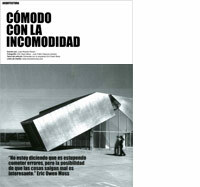 Architectural Monographs No. 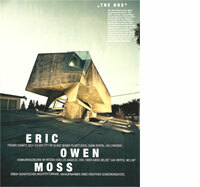 29, featuring the work of Eric Owen Moss. 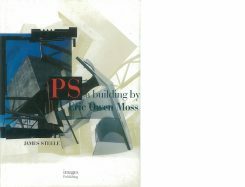 This volume covers 26 of Moss’ projects from 1974 to 1990 including the Petal House and the Paramount Laundry Building. 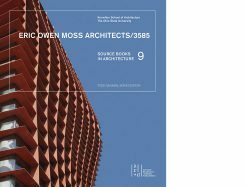 Special issue featuring the work of Eric Owen Moss Architects. 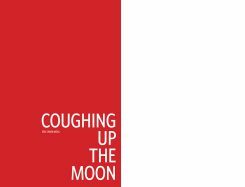 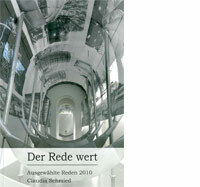 Published by arcVision Publishing House & Edited by Stefano Casciani. 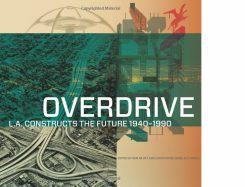 Overdrive: L.A. Constructs the Future, 1940-1990. 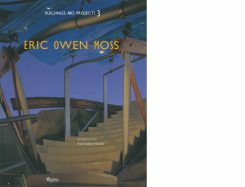 Featuring early works by Eric Owen Moss. 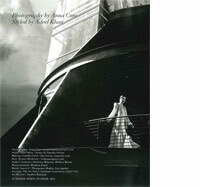 Published by the Getty and Edited by Wim de Wit & Christopher James Alexander. 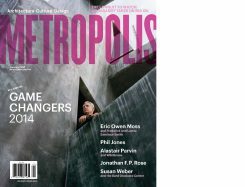 Metropolis Magazine features Eric Owen Moss on the cover of their January 2014 issue; highlighting Metropolis’ pick of 2014 Game Changers. 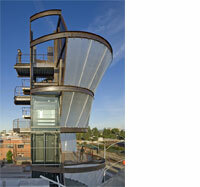 Featuring the Waffle & Cactus Tower by Eric Owen Moss Architects. 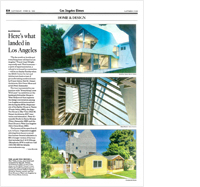 Featuring the “Petal House” by Eric Owen Moss. 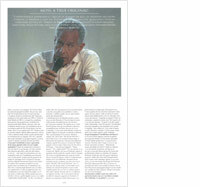 Artforum’s Summer Issue 2013 Vol. 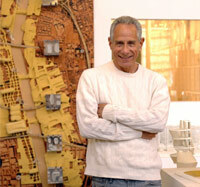 featuring works by Eric Owen Moss Architects. 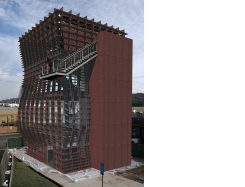 Featuring the Confederacy of Heretics exhibition at SCI-Arc, sponsored by Getty’s Pacific Standard Time Presents: Modern Architecture in LA. 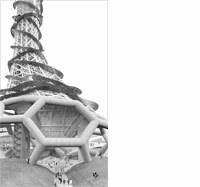 Phaidon Online features the Waffle & Cactus Tower. 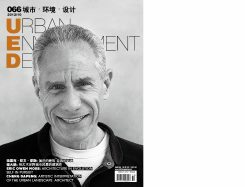 Russian online magazine features an interview with Eric Owen Moss, his work in St. Petersburg, and about how buildings change our future. 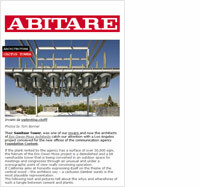 Online magazine features projects Pterodactyl and Waffle currently under construction. 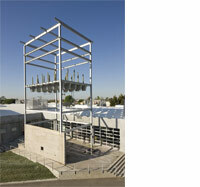 AIA magazine features works in progress Pterodactyl and Waffle. 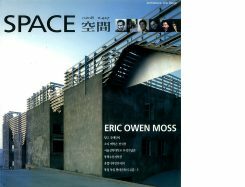 Chinese magazine features an extensive editorial on Eric Owen Moss’ projects and design philosophy, as well as interviews. 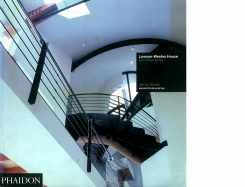 Australian publisher features the Lawson-Westen House. 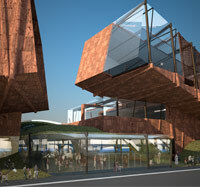 Argentinian online magazine features the competition design entry for the Perm Museum in Russia. 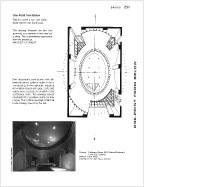 8522 National Conference Room is featured in Wiley publication titled "Architectural Drawing: A Visual Compendium of Types and Methods." 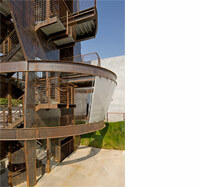 Los Angeles based magazine features Samitaur Tower as the backdrop to a fashion photo shoot. 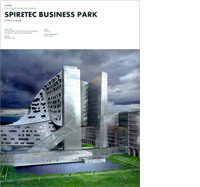 Chinese book HOPSCA features the Spiretec Business Park project proposal in Greater Noida, India. 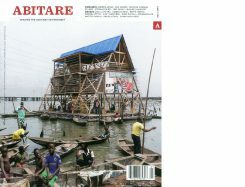 Dutch magazine features Samitaur Tower. 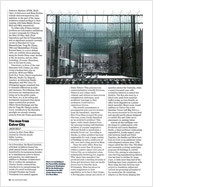 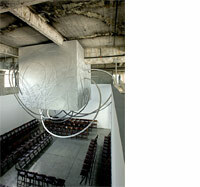 Recap of RIBA’s Charles Jencks Award Presentation that took place in London on December 6, 2011. 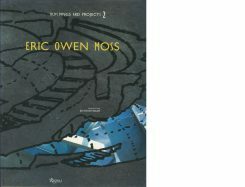 Italian online magazine interviews Eric Owen Moss. 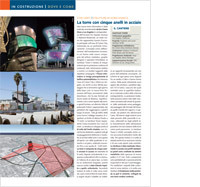 Hayden Tract is featured in the magazine segment "Haute Property: News, Stars and Trends in Real Estate". 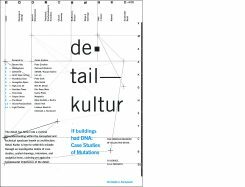 Gavriel D. Rosenfeld describes cultural developments in architecture as the result of important shifts in Jewish memory and identity since the Holocaust. 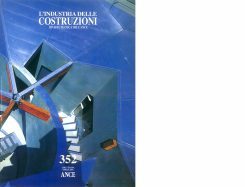 Italian magazine specializing in innovative architecture and construction systems features Samitaur Tower. 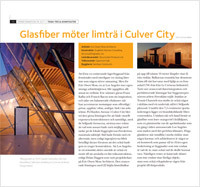 Swedish magazine published by the Swedish Wood Council features Samitaur Tower. 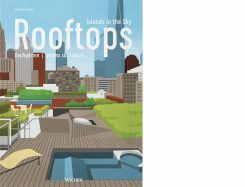 Russian publisher features Taiwan Tower. 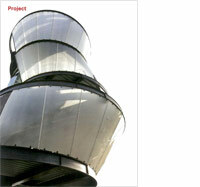 L'Arca, the international magazine of architecture, design and visual communication, features Samitaur Tower. 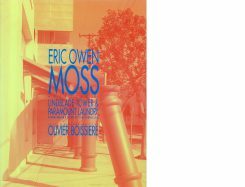 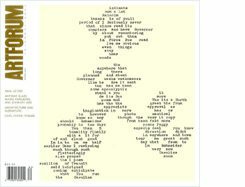 Editor Ruturaj Parikh interviews Eric Owen Moss and reviews Samitaur Tower. 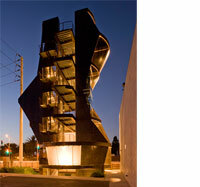 Paola Giaconia reviews Samitaur Tower in Culver City. 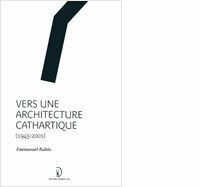 French author Emmanuel Rubio investigates the impact of cataclysmic events on architecture. 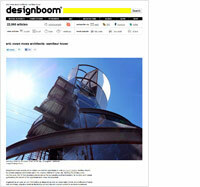 Editors from Designboom visit the office and report on Samitaur Tower. 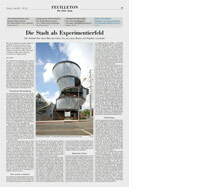 German publisher Braun features project Pterodactyl. 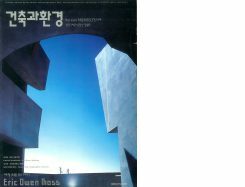 Vienna University of Applied Arts interviews Eric Owen Moss about the meaning of utopia, human experience and intelectual chimney sticks. 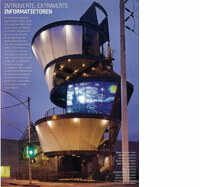 This Argentinian magazine features Samitaur Tower. 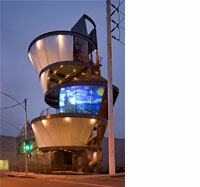 Temporary Architecture Now! 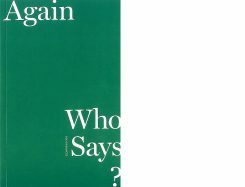 : If Not Now, When? 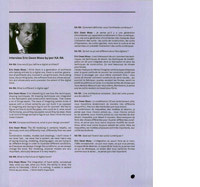 Publisher Taschen features If Not Now, When? 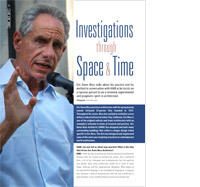 in this book edited by Philip Jodidio. 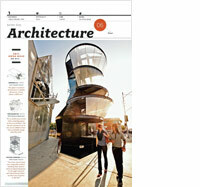 French architecture and design magazine features Samitaur Tower. 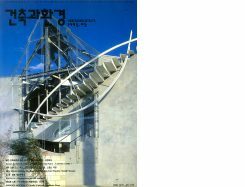 Japanese magazine features Samitaur Tower. 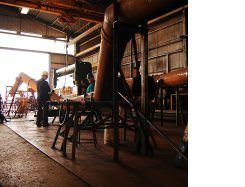 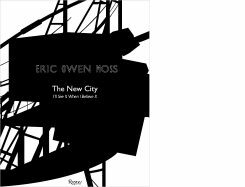 Writer Michael Webb describes how Eric Owen Moss revitalizes a blighted industrial zone. 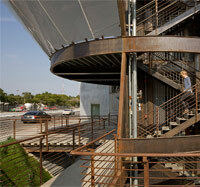 Los Angeles Magazine features the Hayden Tract as one of 10 great walking tours in the city. 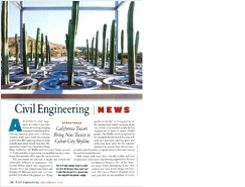 Italian magazine features Cactus Tower. 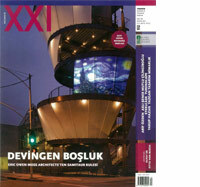 Turkish magazine features Samitaur Tower. 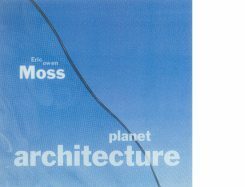 >bmm: Moss, A True Original! 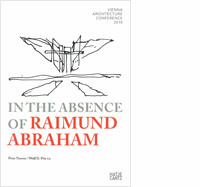 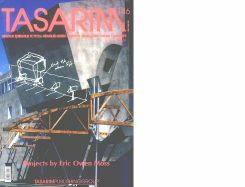 This commemorative book published by the MAK includes Eric Owen Moss' introduction speech for Raimund Abraham's lecture at SCI-Arc in March 2010. 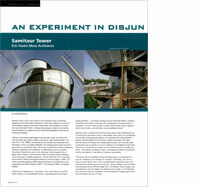 AIA published magazine features Samitaur Tower. 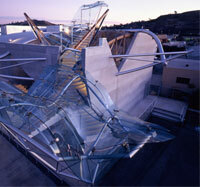 SCI-Arc Director Eric Owen Moss responds to Patrick Schumacher's lecture at the school in September 2010. 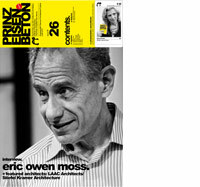 Austrian Culture Minister Claudia Schmied introduces commissioner Eric Owen Moss of the Austrian Pavilion at the 2010 Architecture Biennale in Venice. 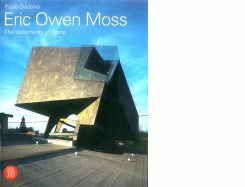 Ecole Spéciale d’Architecture interviews Eric Owen Moss.